Obituary for Edward F. Tryba | Peterson Kraemer Funeral Homes & Crematory Inc.
Edward Frank Tryba, 91, after living a full life, died in his sleep at Aspirus Wausau Hospital on December 2, 2018 after a 5 ½ year courageous struggle with dementia while under the care of Aspirus Palliative and Hospice Services. 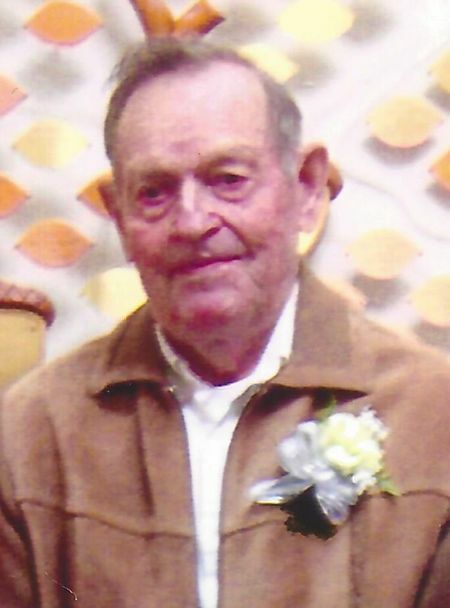 He was born at the family home in the Town of Reid on July 24, 1927 to Benjamin and Johanna (Dallman) Tryba. He was raised on that family farm along with four brothers and five sisters. He was united in marriage to Florence Wilk on November 23, 1949 at St. Florian Catholic Church, Hatley and recently they celebrated their 69th wedding anniversary. Together they had three children. After leaving the family farm in 1954 he got his CDL license and he drove truck for Beyreis Fur Food until they closed. He then worked at SNE Enterprises (along with farming) before “retiring” in 1989. He may have retired from the work force but not work. Even after “Retirement” he worked part time at Hatley Veneer Co. but farming was in his blood. His big hands gladly did any job necessary on his farm, which he and Florence purchased in 1968. It was home to him because it was across the field from the farm he was born. After selling the herd, he still baled hay and even enjoyed gardening (even if he didn’t like vegetables). Not only was Ed a workaholic, he was a man with a big gold heart. He had amazing patience, never complained, and appreciated the little things in life because he said “Thank You” a lot. He would make sure his “special” daughter, Diane, was taken good care of. He would gladly drop whatever he was doing to help someone in need even if it meant leaving his work behind. His skills as a woodsman, carpenter, mechanic, plumber, etc. came in handy and was much appreciated by all his family and friends. His only fault was he had a sweet tooth (that would cringe any dentist), and ferocious appetite that kept Florence busy in the kitchen for hours. Ed wasn’t all work and no play. He enjoyed polka music, a cold beer, Chet & Emil’s chicken, deer hunting (until Macular Degeneration stole his vision), the outdoors (especially “adventure“ walks in the woods with Zach, listening to Brewer games on the radio (in 2002 he was able to attend a game in the new stadium with his grandson before his eyes went bad). Ed is survived by his wife of 69 years, Florence, children, Darlene A. Jacobson, Pickerel, Diane F. Tryba at home and Darrell (Kim) Tryba, Hatley, five grandsons, Neil E. (Heather) Jacobson, Hatley, Robert L. (Darlene) Jacobson, Birnamwood, Matthew J. Jacobson, Wausau, Mark A. (Amanda) Jacobson, Wausau, Zachariah D. Tryba, Wausau, three great grandsons, Nathan T. Jacobson, Carson VandeWalle and Cameron R. Jacobson, two brothers, Daniel (Alvira) Tryba, Hatley and John Tryba, Sheboygan, one sister, Johanna Landowski, Ringle and many nieces and nephews. He is preceded in death by his parents, his only granddaughter, Marie Kees, son-in-law, Orville Jacobson, brothers: Joseph and Anthony Tryba, sisters, Matti Hack, Lucille Blarek, Delores Wilk and Grace Wilk. The family would like to say a special “Thanks” to all the people who made his last days dignified: Staff at Aspirus Palliative and Hospice Unit-especially Sue. Staff at Legacies by the Lake Memory Care-his CNA Rose at Aspirus at Home and Sister Mary Ellen for all her visits. With all their help Ed had the end of life respect that he so deserved. You are all truly angels.